On March 17 in Santa Tecla, El Salvador, an unknown man approached Barahona, who was accompanied by his driver Francis Martínez and a church musician, and started shooting at them. Barahona was unharmed, but Martinez was hit in the stomach and his arm was broken by one of the gunshots. 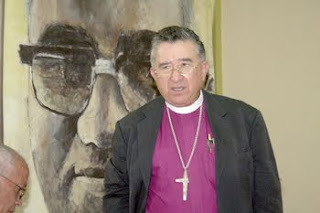 The Anglican Episcopal Church of El Salvador issued a statement March 18 denouncing the attack, and Barahona held a press conference March 19, saying the attempt on his life is cause for serious concern in a country that has been rife with gang violence and criminal activity since the end of the civil war in the early 1990s. "I leave the authorities to do their investigation, but I am worried by this kind of violence we are all suffering," said Barahona during a March 18 press conference. "At this point we don't know if there was a particular motivation or whether this was random, which is symptomatic of the pervasive violence that affects all sectors of daily life in El Salvador," [said the Rev. Lee Alison Crawford, rector of Trinity Church in Rutland, Vermont and a member of the Episcopal Church's Executive Council]. Crawford, who is the canon missioner of the Anglican Episcopal Church of El Salvador, said she had been in touch with church members in El Salvador after receiving word of the shooting. The ongoing violence in the country, she said, comes from a "complex combination" of factors, including gang and other criminal activity, a "profusion of arms floating around the country" since the end of the civil war in the early 1990s and the country's economic stresses. A personal note -- I have met Bishop Barahona, a good man and spiritual leader committed to social justice in his country. We can only hope and pray for his continued safety, for healing for his driver, and that this crime, unlike so many others, will not be left in impunity.